I am finally writing down my labour and delivery story. 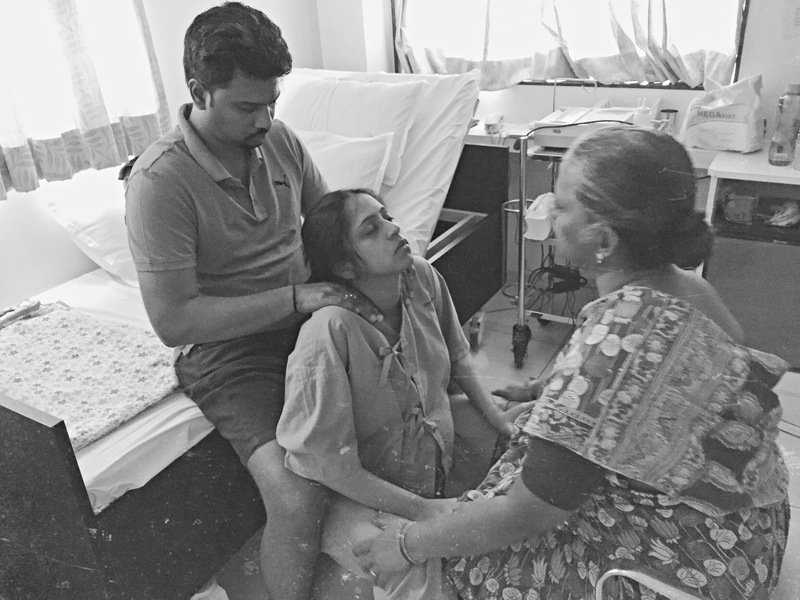 I had a natural birth – a birth without any medical intervention. My labour lasted for almost 24 hours. It was long. It was difficult. But the most empowering experience. The reason I write about this is that my natural birth has been the most positive experience of my life. And I want to share it so it could inspire more people to birth naturally. Alright, it is story time now. You could grab a cup of coffee. NESTING INSTINCTS. I was cleaning up the kitchen, arranging and rearranging every possible thing in my house. Later that evening we went to a hill nearby, had chai in a tapri. It felt good. I was feeling very different on this particular day. I felt like having a good back massage so I asked my husband to give me a sesame oil massage. Once that was done, I went on to take a really hot shower (in the month of May!). While bathing my instincts told me that this was going to be my last shower in total peace. FYI: When babies come it is almost impossible to have peaceful showers. And exactly at that moment, I had my FIRST CONTRACTION. My heart and my mind knew it was a contraction. I went on to have a very elaborate lunch, napped well and went to my yoga class in the evening. The contractions were getting regular and I knew labour was establishing itself. I told my yoga instructor about the contractions and she decided I should be doing more exercise. So I did 180 squats. Yes, 180 with contractions! I did few rounds of duck walk, malasana and titli asana (butterfly pose). All this helped me progress well. Also, it was a natural pain relief. If you wish to read about my pregnancy diet and workout, you may do so here. I remember this well. The contraction that took me aback was the one in the car while I was going back home from the yoga class. It was a big one. The kind that you have to pause and breathe through. And at that moment I knew there was no looking back. This baby is coming soon. Back home I had an early dinner. My father had arrived from Chennai. I went down for a walk with my mother and Shyam. As I was walking I had this weird craving to drink Coca-Cola. I do not know why Coca-Cola of all things – I ended up having one. By this time my contractions were coming every 5 minutes and were lasting for 30-40 seconds. My hospital was one building away so I was in no hurry to rush to the hospital. I was waiting for 5-1-1 to establish before heading to the hospital. I decided I would catch up on some sleep (LOL). But before I knew, my contractions had passed the 5-1-1 mark. And my uterus was going bang-bang-bang. FYI: 5-1-1 is the golden rule for contractions. That is, when contractions come every 5 minutes, each lasting a full minute, and have been that way for an hour. At around 12:30 AM (on May 20th) we decided we should go to the hospital. Once we reached the hospital, my doctor did an internal and said I was already 4cm dilated. I was very happy and I thought things will move faster. The doctor said I may even deliver by 7 or 8 in the morning. We decided to stay back at the hospital and moved into our private room. My doula (Zoe) arrived in a couple of hours. The night was not crazy. The pain was definitely not good but it was bearable. I was moving around. Aromatherapy and back massages were helping me. Shyam and Zoe were taking turns to massage my back. By this time I was having natural instincts to bear down. Before I even knew it was morning. It was probably the most difficult morning of my entire life. I was experiencing contractions back to back without any break. I was happy with the way my contractions were coming because it meant my body was doing its job well. But the pain was getting unbearable. I remember clinging on to a wall while Shyam & Zoe were massaging my back vigorously. While all this was happening my mom and dad came to the hospital and got us breakfast. It was my favourite food – IDLI! I was freaking hungry but my pain was troubling me. 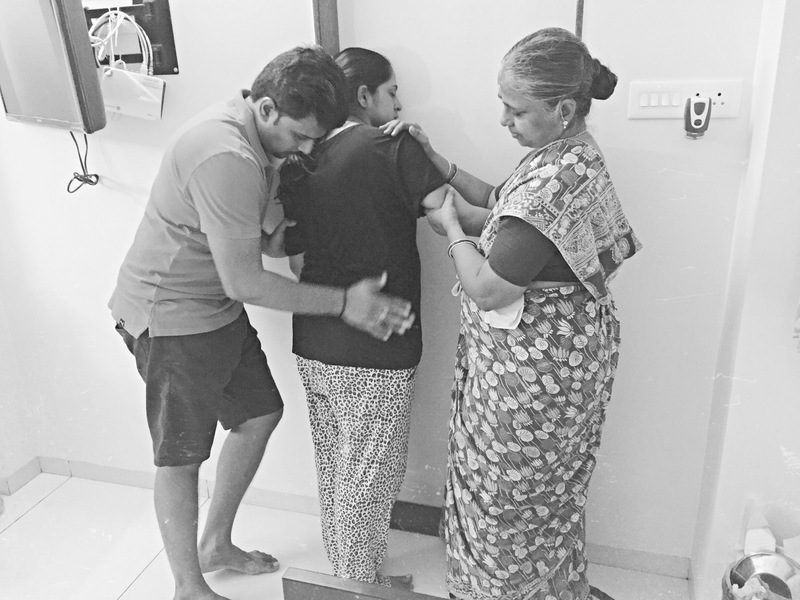 Zoe and Shyam were feeding me and I ate 4 idlis – I would have eaten more if not for the pain. I also drank coconut water. And it was this food and fluid that gave me all the energy to push through the labour. I knew I was progressing well. My bag of waters had not broken yet. Things were moving at its own pace. The doctors knew I wanted a natural birth so there was no force from their end to rush through the labour. The contractions were terrible. My mother, Shyam and Zoe were helping me cope. The back-massages, aromatherapy, birth ball, moving around – all this worked magic. But nothing could make me forget that pain. My uterus was literally banging with no intention of giving me a break. I was wailing in pain. I went to take a hot water bath. We added some peppermint oil to ease the pain – It helped. And when I had finished bathing I felt a strong urge to poop. Okay, I know this is too much information but you are reading a labour and delivery story – so that’s expected. At that point, I did not realise that the sensation of poop is your body’s natural way of indicating that you are ready to push the baby. I told my doula and she said that maybe my body is now ready to push. We then called the doctor to check my dilation and to my surprise, I was 10 cm dilated – Complete Dilation. FYI: Early Labor Phase –The time of the onset of labour until the cervix is dilated to 3 cm. Active Labor Phase – Continues from 3 cm until the cervix is dilated to 7cm. Transition Phase – Continues from 7 cm until the cervix is fully dilated to 10 cm. 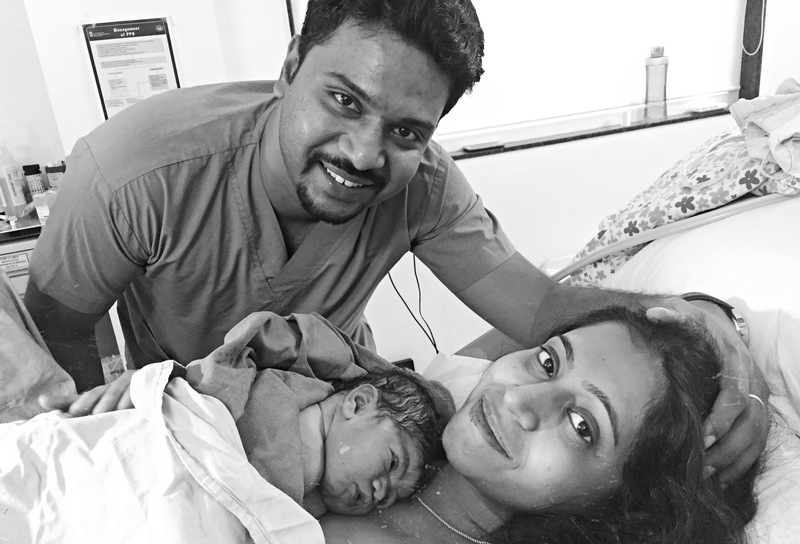 My doctor felt that it was now time to shift to the labour room as the baby could be here any time. And just when I was getting ready to leave to the labour room, my bag of water broke. I was happy. In all that pain, I was happy that I came this far without any medical intervention. My mother and Shyam motivating me. I was ready to push the baby out. My body was telling me to push. I thought Bunny would come ANY MINUTE now. But Bunny had different plans! Inside the labour room, I was trying all sorts of positions in which I felt comfortable to push. I tried squatting, lying down, malasana – everything. But I guess Bunny had no plans of coming out early. I was sipping tender coconut water inside the labour room. And pushing with each contraction. The best thing about my delivery was that nobody told me how to push. Nobody forced me or hurried me – I was pushing based on my instincts, and I was taking my own sweet time. My doctor said as long as the babies heartbeat is fine, we are good. Time passed, it was one hour – two hours – but no progress. By now, my doctor was a little worried about the time I was taking. But that is all I was able to do. I kept drinking coconut water and pushing through each contraction. 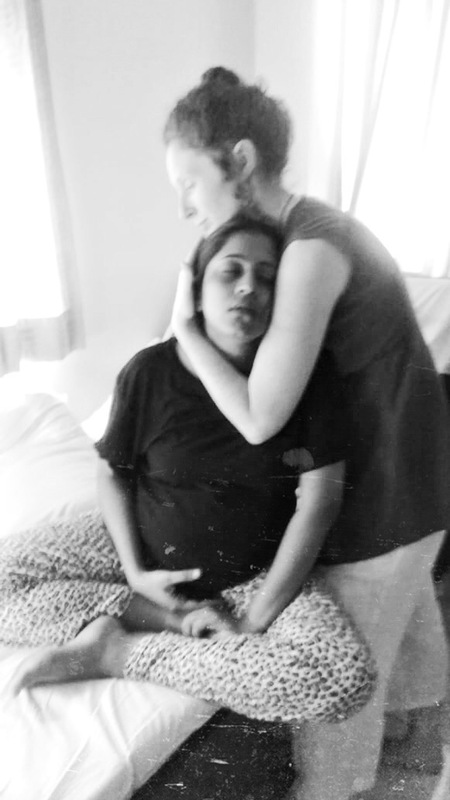 By now I was not feeling any pain – either the contractions had stopped or I was in a meditative state of mind. I was only focussing on my breathing and pushing. I’ve no memory of what happened around. I was in a transcendental state – Not kidding. Shyam and Zoe were motivating me. Their soothing words helped. My doctor was very supportive. All this helped. Pushing is the most difficult thing I’ve done in my life. Truly. Because more than the body it is your mind that does the job. And to bring your mind to focus amidst all the pain is quite daunting. Pushing was hard – very hard. I was pushing, pushing and pushing. Everybody around was motivating me. It helped but I wanted it to end. It was too tiring. Everything was blurry. I was tired. The doctor was talking to Shyam and Zoe about how Episiotomy could speed up the process. I did not want an Episiotomy. Having Zoe with us was the best decision we made – She was a huge support for Shyam inside the labour room. Suddenly there was excitement in that room. My husband told me that he could see the baby’s head. I wanted to see the baby’s head too. The doctor told me I was almost there. I was more focused and determined – I just wanted this baby out. Everyone was joyous because they were able to see the progress down there. The last few seconds are fresh in my memory – I remember my last push well. I knew THIS WAS GOING TO BE IT. ONE LAST PUSH and BUNNY CAME EARTH-SIDE. There was ecstasy in the room as she slid down. That second when they put Bunny on my stomach. That feeling of a warm squish ball against my body – Oh, that was the best feeling in the world. I cannot tell you how happy I was to feel her finally. I have no words to explain that. I was not crying. 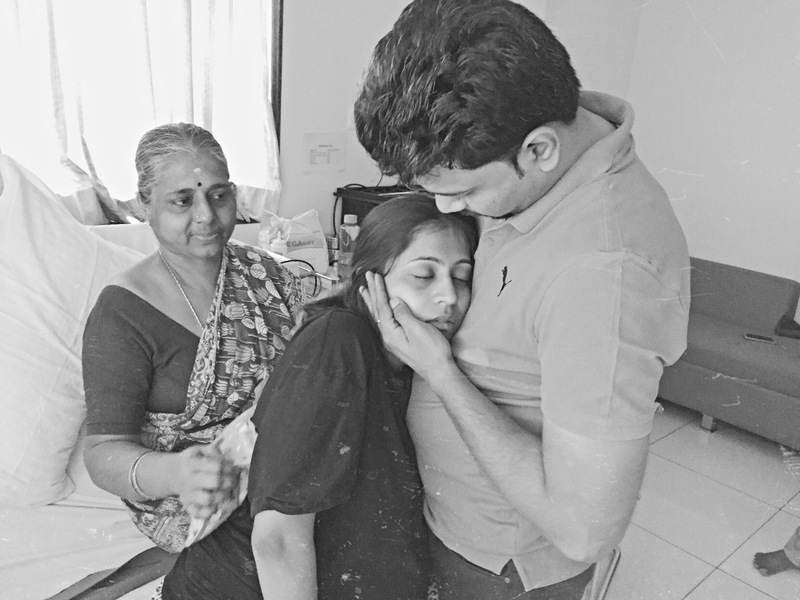 I looked at Shyam – he was crying. He kissed me on my forehead and that was the sweetest kiss ever. We did not say anything to each other but we knew our lives had changed – forever. Bunny was crying her heart out. I asked the doctor if it was a boy or girl? The doctor said she didn’t know. Bunny was lying on her tummy – She had pooped all over me and it was messy. I tried to figure out and I saw the umbilical cord and thought it was a boy – LOL. I told you, it was all blurry and messy. For some time we all believed that it was a boy. And just when we picked Bunny up to bring her close we realised IT WAS A GIRL. It was a funny moment. She latched on and breastfed within a few minutes of her birth – something I am so grateful about. It was because of my doula, Zoe that I breastfed Bunny within minutes after her birth. We delayed cord clamping, i.e. cutting the umbilical cord after it stops pulsating. Placenta birthed naturally. They cleaned Bunny and did some routine tests. Meanwhile, I had a third-degree tear (no episiotomy) and my doctor was checking my internals to ensure everything was fine. I was feeling dizzy and tired. My mom and dad were waiting outside. We moved into our private room and Zoe made me a peanut butter sandwich. I realised I was very hungry and I ate some more sandwiches. I was not in any pain because it was a natural birth, but, I was tired. Shyam and I did a lot of skin to skin with Bunny. In fact, it was Shyam who did more skin to skin with her. I guess he loved it. Skin to skin with a newborn is the best thing ever, guys! We stayed in the hospital for 2 more days – it was the hospital’s procedure to monitor the baby for a couple of days. Because it was a natural birth, I was healthy. In fact, I was back to my normal self. Bunny was healthy too. Shyam stayed with me in the hospital. Those 2 days were so precious and memorable. Those moments where the three of us bonded as a family for the first time is something I hold very close to my heart. And that’s it. This is my story. Every time I think of my birth I am filled with a renewed sense of energy. My natural birth was the best thing that happened to me and my family. I still can’t believe that I birthed without any medical intervention. It was a dream come true. Birthing naturally is easy but you need good support. And I’m so glad I had the best birth team. Shyam, my mother, Zoe (my doula), my doctors, BUNNY and MY BODY. I am grateful for this positive experience. So much so that I want every woman to have the same (or even better) kind of birth experience that I had. If you’ve read till here – Thank You very much. I loved sharing my journey with you. Read more about my Pregnancy Diet & Fitness here. I’ve also documented everything that I learnt about Natural Birth here. Give it a read. Connect with me on Instagram for daily musings. Thank You for reading!